available with this Kit make it one of the most cost effective and efficient RNA isolation procedures available. The universal column can be used to isolate total RNA, large RNA, or small RNA. 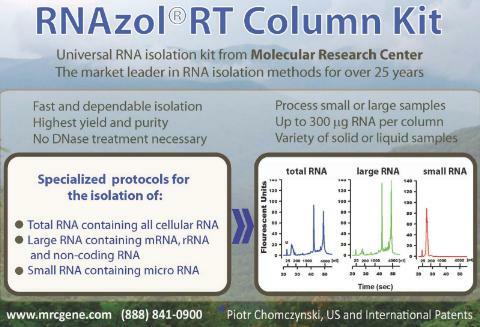 Isolate total and large RNA fractions in 30 minutes. Isolate small RNA in 60 minutes. At least 300 μg RNA can be isolated on a single column. Isolates pure and undegraded RNA from solid and liquid samples of human, animal, plant, bacterial and viral origin.